The most commonly heard advice for Barack Obama when he becomes president in January is to "govern from the center." In Washington, that means reaching out to the minority party in Congress to seek common ground. 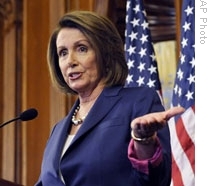 Democratic House Speaker Nancy Pelosi is one of those who says Mister Obama will have to listen to all sides -- from liberal to conservative -- but stay centered. NANCY PELOSI: "Each side of the spectrum can hope to influence the decision. But the fact is that a new president coming in, in my view, must take the country down the middle to solve the problems, to gain the confidence, to take us more strongly in a new direction." The Republicans have been in the minority in Congress for the last two years. Last week's elections brought more losses in both houses, plus the White House. 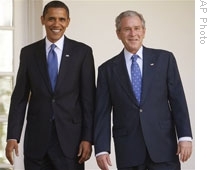 Barack Obama won fifty-three percent of the popular vote and twice as many electoral votes as John McCain. In the last presidential election, thirty-seven percent of voters said they were Democrats. An equal percentage said they were Republicans. This year, thirty-two percent of voters told news organizations that they were Republican. And thirty-nine percent said they were Democrats. Yet, as many observers have pointed out, those same polls showed that political beliefs have changed little over the past four years. Twenty-two percent of this year's voters said they were liberal, while forty-four percent described themselves as moderate. Both numbers were almost unchanged from the last election. And the share of conservatives did not change at all: thirty-four percent. Brian Darling is with the Heritage Foundation, a research group. BRIAN DARLING: "Exit polling indicated that the American people still consider themselves reasonably conservative. This is a more of a center-right nation. So what President Obama has to worry about is he cannot move forward on actions that would offend many Americans, like taking action to take away many Americans' guns, maybe something on gay marriage, issues like that." Democrat Bill Clinton had a Democratic majority in Congress when he was first elected president in nineteen ninety-two. Yet two years later, voters gave control of Congress back to the Republicans. Now, the Republicans are thinking about what they need to do to regain voter trust. That includes increasing their appeal to blacks, Hispanics, women and the poor. A majority of voters from these groups voted for Mister Obama. Louisiana Governor Bobby Jindal, the son of Indian immigrants, is a rising star in the party. So is Minnesota's Tim Pawlenty. But one person some Republicans are looking to for the future is the governor of Alaska. Sarah Palin, John McCain's choice for vice president, says she has not ruled out running for president in four years. She has strong support among social conservatives. But winning over moderate Republicans and independent voters will mean having to aim more for the center. And that's IN THE NEWS in VOA Special English, written by Brianna Blake. I'm Steve Ember.